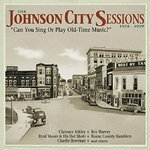 The Johnson City Sessions 1928-1929: Can You Sing Or Play Old-Time Music? The Johnson City Sessions were held in Johnson City, Tennessee in October 1928 and October 1929. This work "...marks the first time these recordings have been assembled in any format. Collectively, these 100 songs and tunes are regarded by scholars and record collectors as a strong and distinctive cross-section of old-time Appalachian music just before the Great Depression. The four CDs gather every surviving recording from the sessions, while the accompanying 136-page LP-sized hardcover book contains newly researched essays on the background to the sessions and on the individual artists, with many rare and hitherto unpublished photographs, as well as complete song lyrics and a detailed discography." -- Back cover. Ted Olson (East Tennessee State University) and Tony Russell are the re-issue producers.